I think this could be because you are setting the actor's location to increment by the z length of your actor bounds for every tick of Update on the Timeline_Rotate node. If would recommend lerping between your position to the top of the ladder on a separate timer. Thanks for the answer! This is what I was also thinking, but when I connected the "Set actor location" to the "finished" out node of the timer, the same thing happened but this time I had to press space twice. I also don't know how to make a second timer so that they could run simultaneously, since you can't split an out node into two if you know what I mean. I know what you mean! I recently learned of a node that helps in situations like this. You should try the 'Sequence' node, if you use it before your timeline I think it will do what you are looking for. It is odd that the behavior is the same when you set it to Finished... Finish should only fire once, when your timeline node finishes. If you watch your graph while you play, does finish fire more than once per press? Well, I am not entirely sure why thats happening, but as another tip, you can set up your graph to be watched after you start your game. You will see a dropdown menu just above the graph. Anything spawned during gameplay will not be selectable until you have started playing and it has spawned. Oh okay, it works with the object selected. Never thought of it, thanks :) Anyways I don't know what's wrong, it's firing okay... I was thinking that maybe the fact that the character is a movable physical object that is affected by gravity or something...? 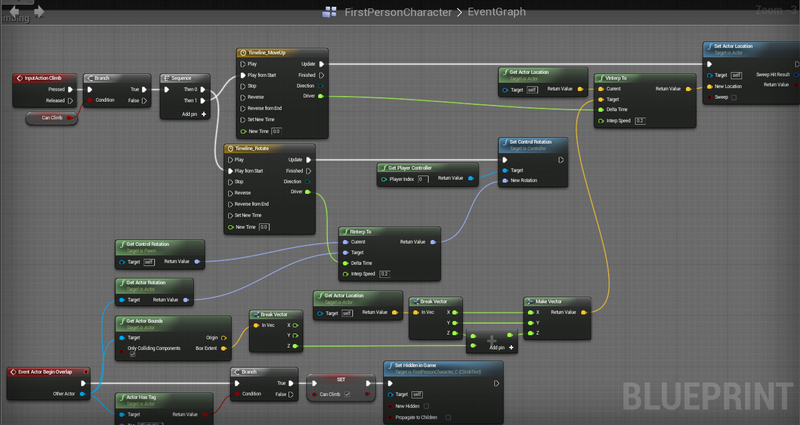 That it tries to move up a little bit every tick of the timeline but the physics and gravity drag it down every tick as well so it stays on the ground? Because when I remove the timeline and interpolation and leave just the "set actor location" there it works - the character instantly "jumps" to the desired position and then falls back down due to the gravity. What do you think? I would say that is an excellent hypothesis. You could try changing your character's movement type to flying, or somehow counter gravity for the time you are under the effects of the Timeline node. Okay it looks like I was right. When I inserted "set movement mode: flying" between the sequencer and the timeline it works okay. Would you mind helping me make the "move forward a bit" part as well please? I can get a forward vector of the trigger box but I don't know how to combine it with the character location so that it moves in that direction about 30 centimeters. The thing is I can't just move the character forward relative to the character's orientation because the character will be moving forward while still rotating from the first part. I hope you understand. Thanks!! You could try moving the character forward after rotation is complete. This question has gotten pretty out of scope as it is and due to the way answerhub works each time we comment it gets popped back up to the top of the stack. You should close this question and open a new one when you feel you have put forward a solid amount of research into your next question. You have a pretty solid foundation it seems, but don't forget Epic has a whole slew of tutorials and it is generally better if you put a few hours of study in and pick up a whole lot of other skills that will be useful along the way. Experimentation and expanding your knowledgebase can be very rewarding. Yes, I thought you would say something like this, I also though it might be a little off-topic. Anyways, thanks for all your help!! Fable 2 Power bar Help!!! !